Typhoon Haiyan was an exceptionally powerful tropical cyclone (Storm strength: Category-5 equivalent super typhoon) that devastated portions of Southeast Asia, on November 8, 2013. Phillippines was affected most with about 8000 people killed. Haiyan is also the strongest storm recorded at landfall ( (the event of a storm moving over land after being over water), and unofficially the strongest typhoon ever recorded in regards of wind speed. As of January, 2014, bodies are still being found. A week after the typhoon had struck on president Benigno Aquino was in under growing pressure to speed up the distribution of food, water and medicine to desperate survivors and to get paralysed local governments functioning. There had been several controversial media releases of the death toll. The Philippines formally asked Washington for help, one day after the storm slammed into cities and towns in the central Philippines. While international efforts are beginning to come in, petrol station owners whose businesses were spared have refused to reopen, leaving little fuel for trucks needed to move supplies and medical teams to affected areas. Bodies laid on the street and some even in body bags outside the demolished city hall, awaiting mass burials. The city government remains decimated, with just 70 workers compared to 2,500 normally. Many were killed, injured, lost family or were simply too overcome with grief to work. United Nations has ‘let people down’. The United Nations has admitted its response to the typhoon disaster in the Philippines had been too slow, amid reports of hunger and thirst among desperate survivors. Thousands of desperate survivors are clamouring to get out of a place where clean drinking water is in short supply and many have no shelter. Many roads were left impassable, cluttered by debris from broken buildings that were destroyed when the ocean surged ashore. After Typhoon Haiyan there were many messages and offers of assistance from a range of international leaders. The aid contributions of China and the United States were given focus with regards to their involvement in the politics of the Philippines. Japan had offered and sent rescue teams to help possible survivors, as well as Russia. – The Philippines faces a humanitarian crisis days after the typhoon hit much of the Visayas with 1.9 million homeless and more than 6,000,000 displaced. – Over one million farmers in the Philippines have been impacted by Typhoon Haiyan according to the UN. 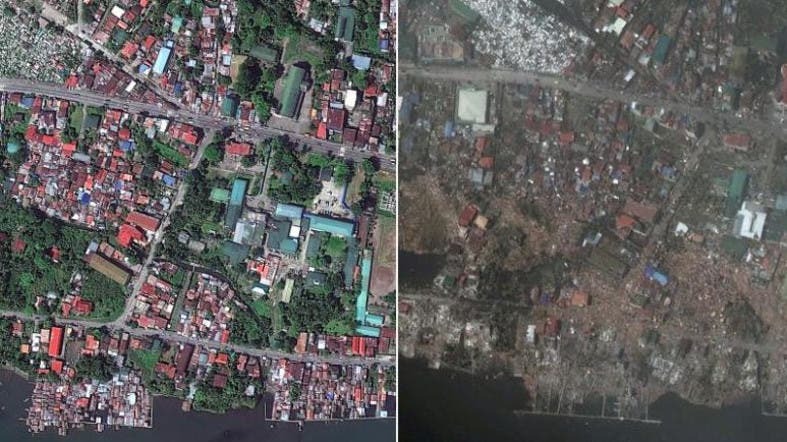 – In Tacloban alone, ninety percent of the structures are either destroyed or damaged while other cities, such as Ormoc, are reporting similar damage. – The United Nations fear that the possibility of the spread of disease is high due to the lack of food, water, shelter, and medication. – Casualties have been reported as a result of the lack of aid in affected areas and the number of dead is likely to rise. – Less affected areas such as Cebu and Manila. Catbalogan reported that their population more than doubled after the typhoon with the influx of refugees into the city. – recent studies suggest that the trail of uprooted trees and environmental devastation they leave behind bumps up global warming by releasing a pulse of carbon into the atmosphere. – The Food and Agriculture Organisation (FAO) saynnjs that hundreds of thousands of hectares of rice have been destroyed. – The major rice and sugar producing areas for the Philippines was destroyed. This would offer opportunities to India, Vietnam and Thailand, the world’s three biggest exporters. – Coconuts account for nearly half the Philippines agricultural exports and the country is the world’s biggest producer of coconut oil. – Between 50,000 tonne and 120,000 tonne of sugar may have been lost, the Sugar Regulatory Administration estimated. – The Philippine government estimated that about 71,000 hectares (175,000 acres) of farmland were affected; 3.7 billion pesos ($85 million) was lost from farm damage. A total of 131,611 tonne of rice was lost, equivalent to a 1.8 per cent reduction in fourth quarter output, and about about 4,000 tonne of corn were destroyed. – Rough rice fell 0.9 per cent to $15.55 per 100 pounds on the Chicago Board of Trade at 1:53 p.m. in Manila. Sugar dropped 6.7 percent in the past year to 18.07 cents a pound in New York. – Due to the rain, the land was muddy and some roadways had black, stagnant water. – Price of building materials inflated. -Phase 1: Raise money through fund raising events such as concerts and fairs. -Phase 2: Make long lasting connections through schools and people in the affected areas.